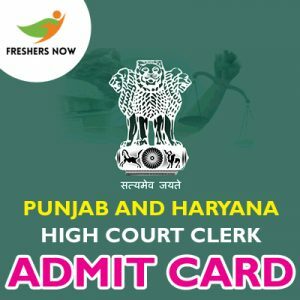 Punjab And Haryana High Court Clerk Admit Card 2019: The Society for Centralized Recruitment of Staff in Subordinate Courts is recruiting on behalf of the High Courts of Punjab and Haryana for 352 Clerk posts. As per the notice, sssc.gov.in High Court Clerk Admit Card 2019 is going to release in the month of February 2019. Also, the candidates can check their scheduled Punjab And Haryana High Court Clerk Exam Date 2019. Besides, it may be in the month of March 2019. Moreover, the candidates can get the Punjab And Haryana High Court Clerk Selection Process 2019 details from the current post. After referring to this post, you will get a clear idea of the Punjab And Haryana High Court Clerk Hall Ticket 2019. Furthermore, scroll down to get the procedure to download the Admit Card. As said earlier, the Officials of the Society for Centralized Recruitment of Staff in Subordinate Courts and the High Court of Punjab And Haryana has decided to conduct the exam in the month of April/ May 2019. Soon after knowing the Punjab And Haryana High Court Clerk Exam Date 2019 the aspirants are eagerly waiting for the Admit Card. Refer to this post for all the details. The Selection Process includes the Written test and the Computer Proficiency Test. At first, in the Written Test, the candidates need to attempt the General Knowledge and English Composition and possess 33% in each subject. Also, but no candidate is considered as qualified in the written examination unless he/she obtains 40% marks in the aggregate of both subjects. Later, the candidates can attend for the second round CPT. Candidates should bring the printout of their sssc.gov.in High Court Clerk Admit Card 2019. A candidate is advised to validate all the details on their Punjab And Haryana High Court Clerk Hall Ticket 2019. Initially, go to the sssc.gov.in the Official website of Society for Centralized Recruitment of Staff in Subordinate Courts. Next, Check for the Link of Punjab and Haryana High Courts. Then, you will find a new page. Now, search for the link of Punjab And Haryana High Court Clerk Hall Ticket 2019 scrolling on the page. Finally, Punjab And Haryana High Court Clerk Admit Card 2019 displays on the screen. For similar information like sssc.gov.in High Court Clerk Admit Card 2019. Keep on visiting our website www.freshersnow.com for latest updates, Admit Cards, Results, Previous Papers, and Syllabus. Drop a comment in the comment section for any suggestions and doubts.